The Sierra Madre Tattler! : How Would You Like To Oversee A Few Hundred Million Dollars In PUSD Measure TT Bond Money? How Would You Like To Oversee A Few Hundred Million Dollars In PUSD Measure TT Bond Money? The Pasadena Unified School District (PUSD) is seeking applicants to fill current vacancies on the Citizens’ Oversight Committee, which is responsible for ensuring accountability of work funded by Measure TT, the school improvement bond approved by voters in November 2008. The committee meets regularly to review spending, financial and performance audits, and the efforts of District staff to maximize bond revenues and minimize costs. The link provided by the PUSD takes you to a lot of photo rich public relations stuff about touring building sites and other fun junkets designed to fill hours that might otherwise be spent doing dangerous things. Like actually looking at how that bond money is being spent. To skip all of that nonsense and go directly to the application itself, click here. Personally I think this is a pretty good opportunity for the fiscally aware and numerically skilled individual of social conscience to do something really valuable for the community. After all, property owners living within the borders of the PUSD will be paying off Measure TT (with beaucoup interest) for the next half century of so. Somebody with a skeptical eye really should be taking a look at all of this. While you are there perhaps you could also look into the following mess, which is detailed in this 2008 Pasadena Star News article (link). Apparently nobody knows to this day how it all turned out. Somehow it all just got buried up and forgotten. PASADENA - A prosecutor who reviewed allegations that a contractor bilked Pasadena Unified School District out of $80,000 said Tuesday the district's records were so confusing, officials could not determine whether a crime was committed. District officials said the investigation was tied to missing funds from Measure Y, which voters approved in 1997 to fix up schools. "Looking at the records they had, we could not conclude what work he did and what work other contractors did," said John A. Perlstein, a prosecutor for the Los Angeles County District Attorney's Office. Pasadena police officials asked Perlstein to look at the district's documents after PUSD officials leveled allegations against Eric Peterson, a project manager for contractor Pacifica Services Inc. Officials suspected Pacifica improperly billed the district for work that was never completed. After reviewing district documents provided to his office by the Pasadena Police Department, however, Perlstein declined to file charges. "They provided the records and we were supposed to guess what was done and was not done," he said Tuesday. Just so you know the kinds of stuff you might be getting yourself into. Since the PUSD does find record keeping challenging, you obviously will have your work cut out for you. So where's the "Community Preservation" part? I was poking around the City of Sierra Madre website looking for something else (didn't find it), when I came across the following somewhat incomplete information. 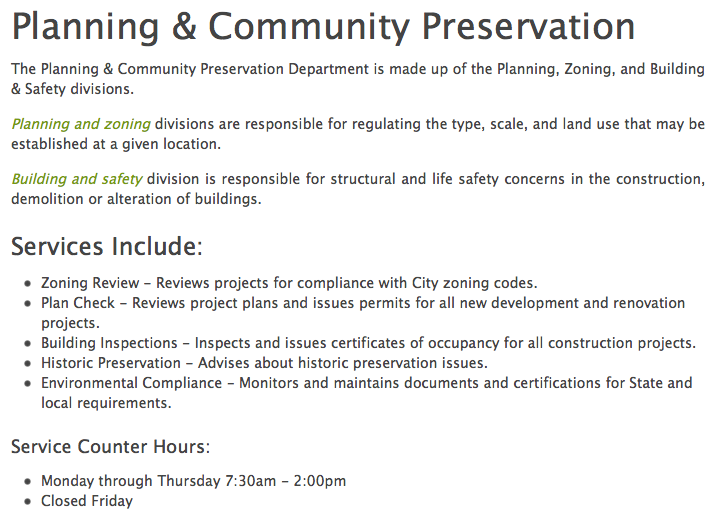 I get all the stuff about "planning and zoning" and "building and safety." But where is the part about Community Preservation? Anybody know? California fuel prices going up as its green-house gas controls hit gasoline, diesel sales - After months of seeing gas prices sink ever lower, Californians will ring in 2015 by paying more at the pump as a result of the state's landmark greenhouse-gas emissions law. But how much more we'll pay, and whether it's worth it, remains bitterly debated among oil companies, some state lawmakers and environmentalists. Starting Thursday, gasoline and diesel producers will be subject to the state's cap-and-trade system, forcing them either to supply lower-carbon fuels -- which are more expensive to produce -- or to buy pollution permits for the greenhouse gases created when the conventional fuel they supply is burned. In the short term, at least, that will mean higher prices at the pump, starting almost immediately. "My understanding from the economists that we've talked to is that it will be very quick, sometime in January -- if not on the first, then shortly thereafter," said Dave Clegern, spokesman for the California Air Resources Board. Opposition groups backed by the oil industry have claimed prices will rise 16 to 76 cents per gallon, although that's admittedly based on an underlying price of about $4 per gallon -- far higher than recent prices. A UC-Berkeley energy and economics expert says it'll be more like nine or ten cents per gallon, which supporters say isn't so high a price to pay for the environmental good it will do. So here is my question. How does creating a brand new gas tax (it really is a tax, you know) do any worthwhile environmental good? I'm not certain I see the connection. Gosh, now there is a surprise. I think it is called grabbing. to answer the last question, I think cap and trade means the extra paid at the pump helps finance clean energy projects thereby contributing to environmental good. So how do you know it won't go for pensions? Jerry Brown has designated a big chunk of it to the boondoggle HSR project: The compromise proposal sets aside $250 million for high-speed rail, which is what the Governor proposed, but future year allocations for the bullet train would be 25 percent rather than the 33 percent he requested. The Senate’s proposal called for 15 percent allocated to high speed rail. And of course Steinberg wants 20% of it to go for MORE CONSTRUCTION to reduce greenhouse gas emissions, right? Great. We will be paying more for gas to fund a train nobody wants and SCAG housing that doesn't sell. It's Moonbeam Mania! Yes. But it will save the world. No, really. Look on the bright side, Mr. Tattler. You kidding? It will go right into the General Fund. This is California. Crooked as a ram's horn. I think 9:01 is confusing federal tax with state tax. Getting something for nothing is a pretty sweet deal — at least if you’re the one getting something. Not so much if you’re the one receiving nothing in exchange. Oil and gas companies are extracting gas from federal lands and paying nothing for much of it, according to a new Taxpayers for Common Sense report. One of our most troubling findings was that gas companies drilling on federal lands have avoided paying over $380 million in royalties on the fuel they’ve extracted over the past eight years. That’s a lot of money — and it could be a lot more, because it’s based on self-reported data provided by the oil and gas industries. And it’s a lot of gas. By the American Natural Gas Alliance standards, the amount of royalty-free gas either consumed as fuel or lost by operators since 2006 would be enough to meet the needs of every household in New York State for a year. A new report by Oil Change International, Cashing in on All of the Above: U.S. Fossil Fuel Production Subsidies under Obama, demonstrates the huge and growing amount of subsidies going to the fossil fuel industry in the U.S. every year. In 2013, the U.S. federal and state governments gave away $21.6 billion in subsidies for oil, gas, and coal exploration and production. The value of fossil fuel exploration and production subsidies from the federal government have increased by 45 percent since President Obama took office in 2009 – from $12.7 billion to a current total of $18.5 billion – a side effect of his Administration’s “All of the Above” energy policy that promotes the U.S. oil and gas boom and amounts to nothing less than climate denial. 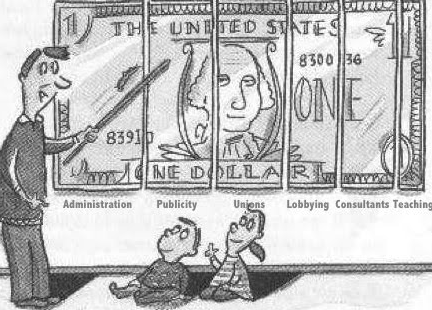 President Obama has repeatedly tried to repeal some of the most egregious of these subsidies, but these attempts have been blocked by a U.S. Congress that has been bought out by campaign finance and lobbying expenditures from the fossil fuel industry. The Republicans have become the oil party, the Democrats the alternative energy party. It is the GOP that is working with the weak hand here. As more people begin to understand and use the alternative energy and storage technology that will liberate them from greedy oil and utility corporations, that balance of power will begin shift. 4:34 good luck with that. $2 gas and sunsetting tax credits will not help your "green" agenda. We'll be cleaning up his messes for years. A convoy of $100,00.00 4WD Pickup trucks just gathered on N. Sunnyside and drove in formation into Monastery. Nice clean one's never used for work. I think they are"'the developers" Something is afoot!! Get pictures! Sounds like an invasion. Can I ride in the truck? Sure. Stand in front of Memorial Park until one of them picks you up. NICE!!! About time, start'15 off moving ahead! Looks like the High Speed rail folks want to build a tunnel under the Angeles National Forest. Oops, I mean National Monument. Sure to be popular with the nature people. The California High-Speed Rail Authority recently decided it wants to get moving ahead of schedule on the portion of the Los Angeles-to-San Francisco line that will run through LA County and now it's looking at a tunnel connecting Palmdale to a Burbank Airport station as a possible alternative to a route that would run along the 14 Freeway through Acton and Santa Clarita, reports the Daily News. The tunnel would go under the San Gabriel Mountains and shorten the travel time along the stretch, though it's not yet known by how much. Also not known yet: how much more it's going to cost. The new route, plus one that runs from Burbank to Union Station will be discussed at an upcoming series of public scoping meetings over the first few weeks in August. In case you didn't know, no high speed rail trains are manufactured in the US. So your additional gas tax money will be going overseas. How to turn a high speed train into a time capsule and a tomb at the same time. Who are the members of the Sierra Madre Water Dept. Bond Oversight Board? How they ever let an interest-only bond be issued is reprehensible. Please release their names so we know who's responsible. Good question. And I do not know the answer. But I do know some people who will. Let me get back to you. Former Cali Governor Steroid Arnie Schwarzenegger, the father of AB32 and therefore this new "save the world from global warming" gas tax, drives an 8 mpg $2.5 million Bugatti Veyron. We strive to be informative and fun to read. Thank you! Why are 99% of elected officials protected by a bodyguard of LIES?